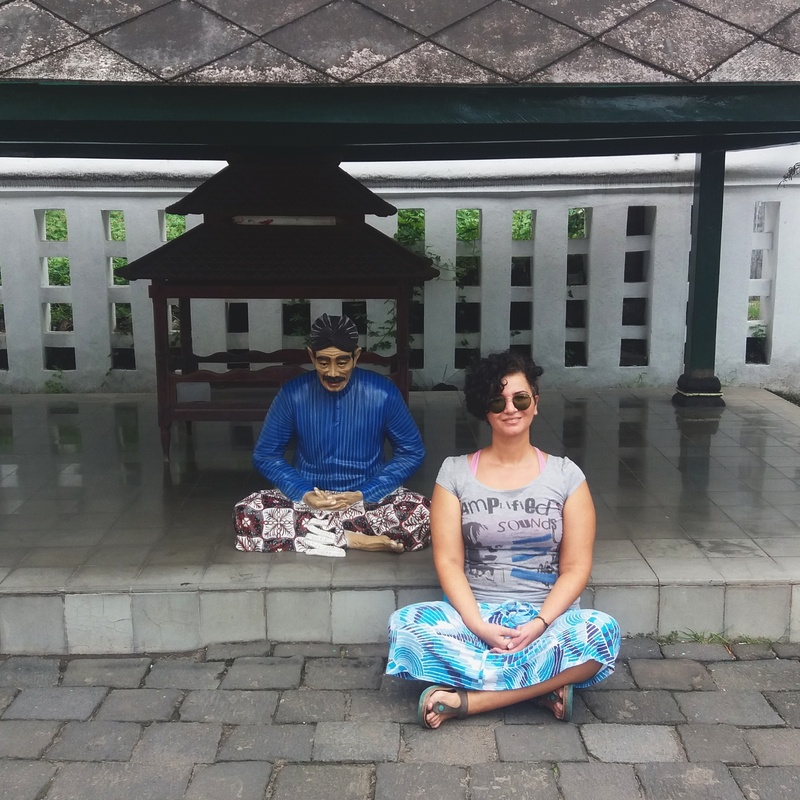 Before going to Indonesia, I had no idea what to expect. The only information I knew about the country was being a muslim country and hosting the world famous Bali and Gili islands. Except these, Indonesia was a complete mystery for me nevertheless after 2 months spent in Java and Bali, it felt like a second home to me in Asia. I haven’t realized it would be Ramadan in the country during my visit. It was an enriching experience to spend Ramadan in a country other than Turkey. I had decided to Couchsurf during my stay in Jakarta and when my host Dedy offered to pick me up from the airport I couldn’t be happier. I knew Dedy has been to Turkey twice but when I figured out that he traveled more extensively than I have, I felt both surprised and embarresed. He came to the airport with a Fenerbahce jersey and the flag to greet me. He guided me through Jakarta and helped me a big deal to find my way around this huge metropolis infamous with its traffic. 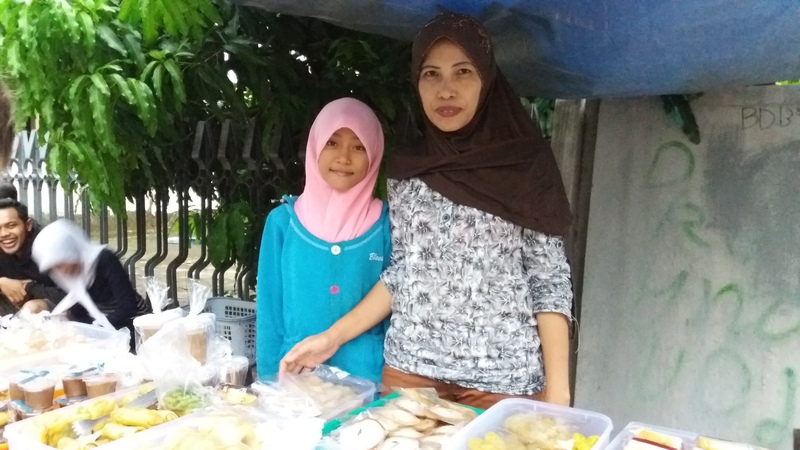 The capital Jakarta is located in Java island and has a dense population of 10 millions. There isn’t much to do in the giant city so many tourists use this place as a hub to connect to other places. I decided to visit Pangandaran thanks to Dedy’s recommendation and he offered me a ride as he was going to travel to a city close to there. The rest became a 12 hours of journey stuck in the traffic jam and became one of my most epic adventures. 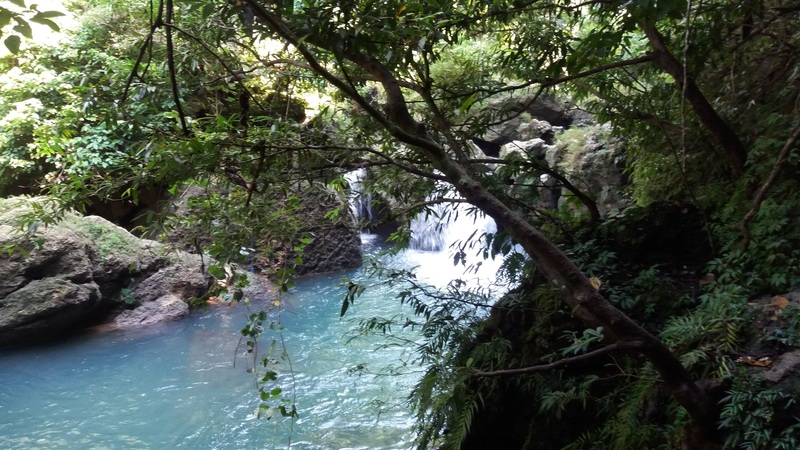 There are two great spots in Pangandaran called the Green Valley and the Green Canyon. In the Green Canyon you can just let yourself to the current and have the chance to do some body-rafting, which is quite full of adrenaline. The glorious trees and the mist over them made me feel that I had traveled back in time to pre-historical ages. As I moved forward in the Java island, thanks to its rich flora and active volcanos I had the very same feeling over and over again. As if a T-Rex would emerge among the trees and attack me. Well, maybe this prehistoric feeling was enforced by a neanderthal character named Java, who is the most loyal sidekick of Martyn Mystere, a comicbook character whom I adore. 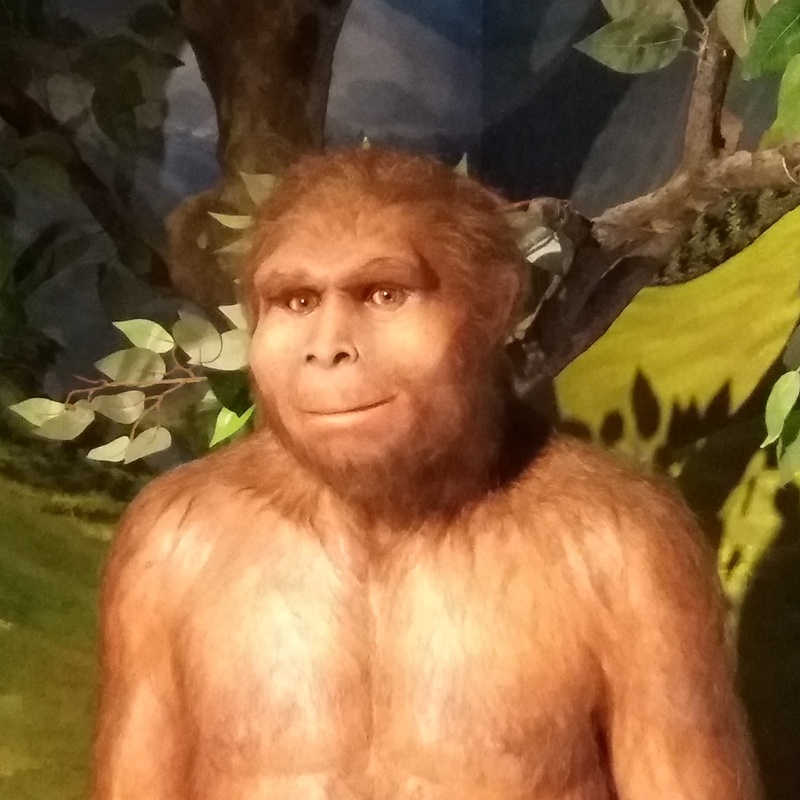 This character was named after Java Man, the first homo erectus erectus whose remains were found here and many scientists believe that he is the missing link between the ape and human evolution. That is why my first stop after Yogyakarta was Sangiran Early Man Site, but I will tell about this later. Another thing, when I planned my trip to Indonesia I haven’t realized that my visit would be during Ramadan time. It was an enriching experience to spend Ramadan in a country other than Turkey. For example, I was quite surprised to find out that, during the first 3 days of Ramadan, Quran was being read through the speakers of 4 different mosques until 5 am in the morning. The beautiful view from my room in Pangandaran. Apparently this was their custom. When I realized some of the preachers were kids, I was even more surprised. Apparently, young pupils from religious schools were making practice by getting tasks like this. 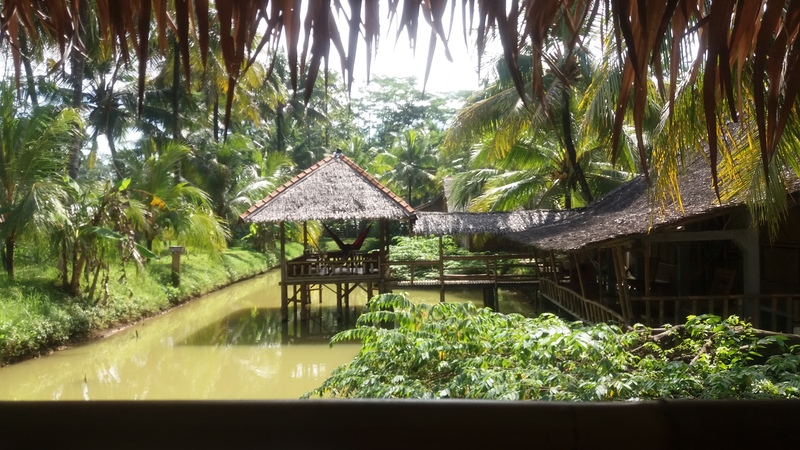 on the first night I was a little terrified wondering what the hell was going on and I asked the guesthouse’s owner first thing in the morning. “Is there ceremony going on? what was that about last night? ” I asked and she was quite surprised about me asking that sort of a question as I am also coming from a Muslim country. She responded “You know, it’s ramadan…” She got more surprised when I told her that we don’t have such ritual in Turkey. This way I had to chance to experience the cultural differences and rituals in two Muslim countries. 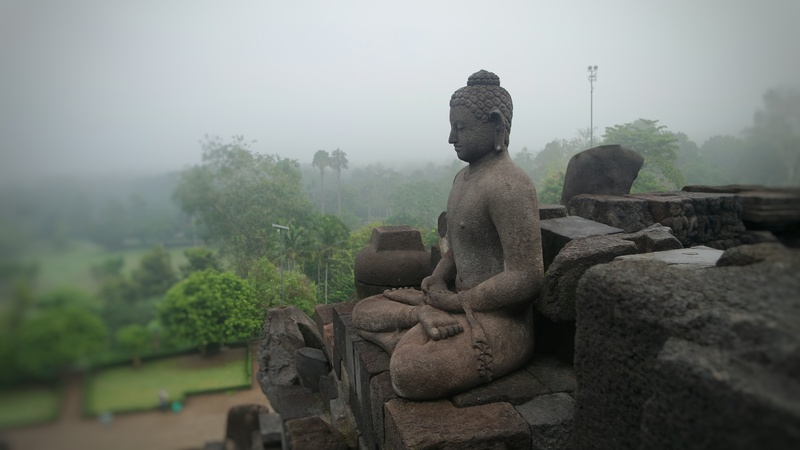 Yogyakarta, the city which hosts one of the most famous Buddhist temples, Borobodur became one of my favorite places in Java thanks to its markets, restaurants and hospitable people. 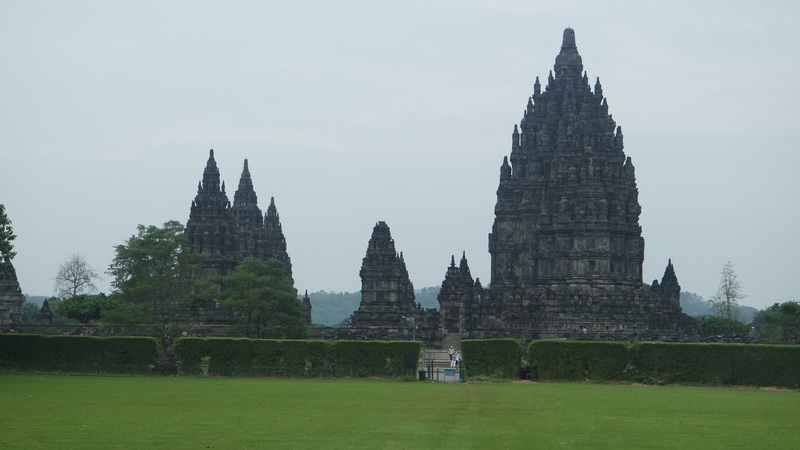 You can also visit another famous temple, Prambanan, a Hindu temple built in the 9th century located just outside Yogyakart but the city offers much more than historical sites. 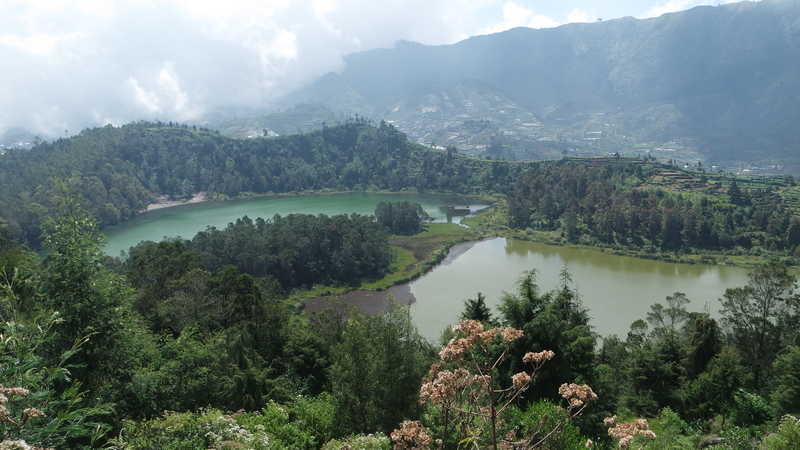 For example, the lake with 7 colors, Telega Warna located in Dieng Plateu, 3 hours car ride away from Yogya, makes a person feel quite lucky to be born an being able to see those sights. 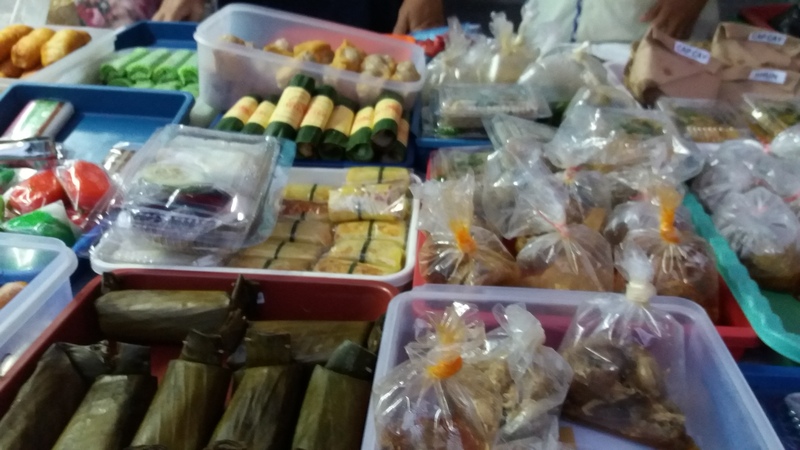 I was planning to stay in Yogya 2 nights but instead I spent 5, thanks to our guesthouse’s owner Eni and the amazing Iftar market located nearby our guesthouse and each day was lived to the fullest. At the end of the 5th day I take a short train ride to Solo. The main reason of coming here is to visit the Early Man Site. I go to the museum by hiring a driver through an app called Go Jek. It is a motorcycle pick up service and it is much cheaper and efficient than taxi, Morever when the driver arrives he provides you a helmet and a mask. Go Jek is one of the most practical applications I have seen in Asia. As an avid nerd, I would never pass Sangiran Museum but when I saw that I was the only visitor in such an important place, gave me a little grief. The museum employees asked me if I was an archeology student (Let me underline the fact that I can still be mistaken as a student here hehe) When I told them that I wasn’t they were even more happier and offered me some tea. The Java men reconstructed over the real skull was something to see. Martin Mystere’s Java was a huge dude but apparently our ancestor was only 160 cm. tall. 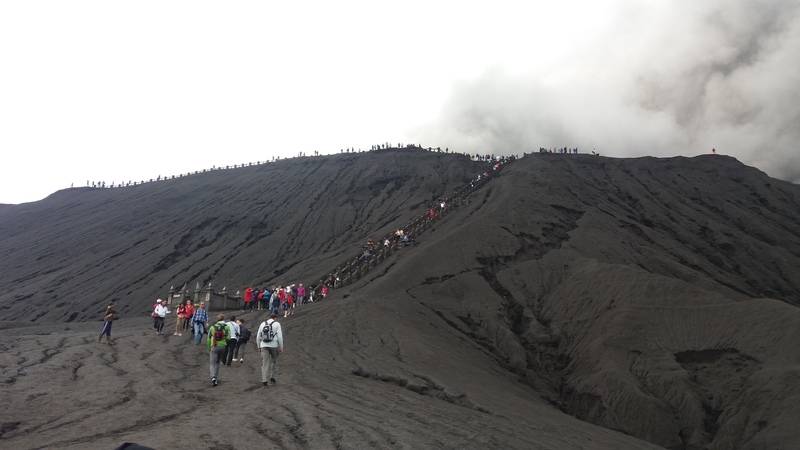 After visiting Sangiran, I left Solo at a heart beat because I have Bromo and Ijen Volcanos on my mind. 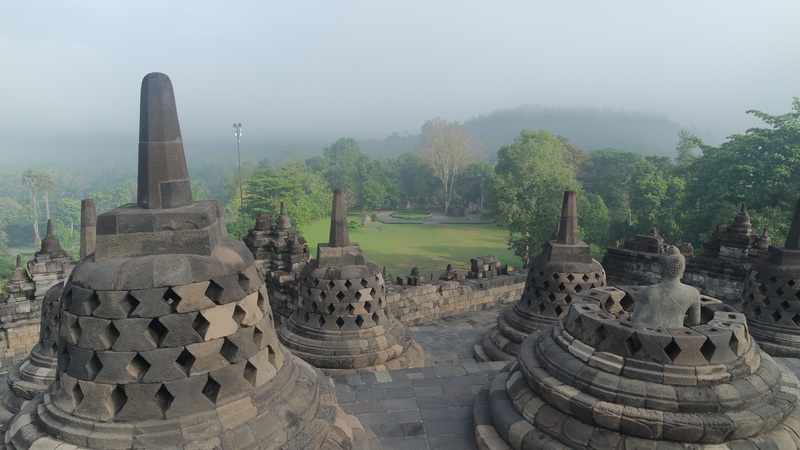 When I got on the train which would take me to Malang, I was planning to see the city for a few days and find a tour company to take me to the sites. But as I step foot on the Malang station I realized it was flooded due to heavy rain. When I was waiting for the rain to calm down I met a Dutch traveler and a Swiss couple stranded in the station just like me. When we started to talk, the Dutch traveler offers to take the tour all together as we might get a discount by the number of the people attending. When I asked him when he was planning to take the tour, I was startled with his answer as he wanted to leave the very same night. 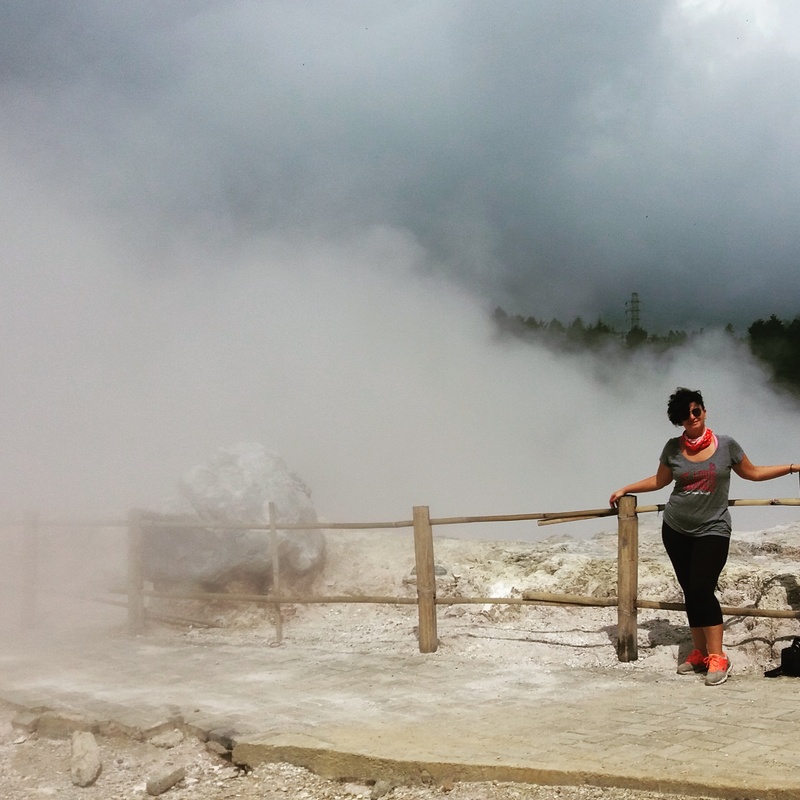 After an 8 hours of train ride I felt reluctant to leave the same day but when the Swiss couple convinced me about it, I agreed leaving with them. As the rain stopped we went to a tour company and buy a tour for Bromo and Ijen which starts at midnight. 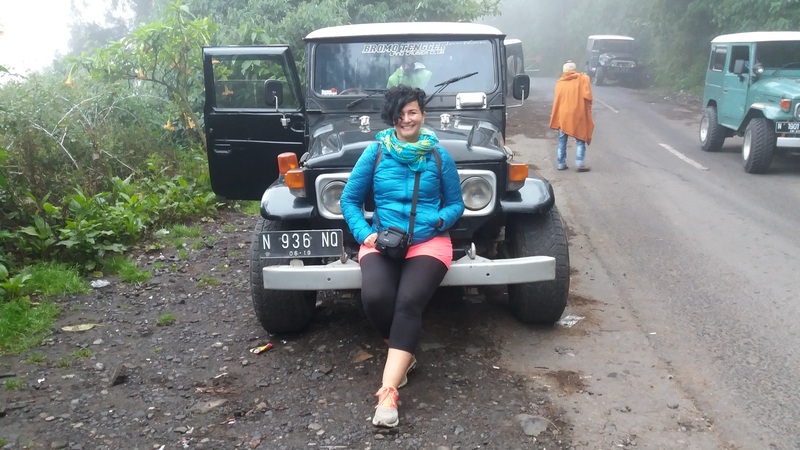 We start our ride in the middle of the night to be able to see Bromo Mountain during sunrise. 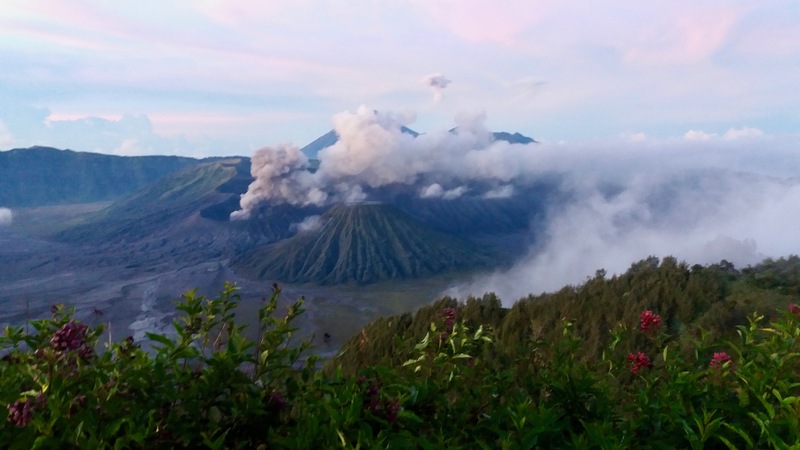 Because of the heavy fog we didn’t get to see much but, once the sun has risen and the fog got clear, we see the spectacular view of Bromo. After witnessing its glory from a distance we moved to climbed its crater. Imagine you are trying to walk in a valley made of ashes and you are surrounded with horsemen riding their horses as they lift the dust all around. 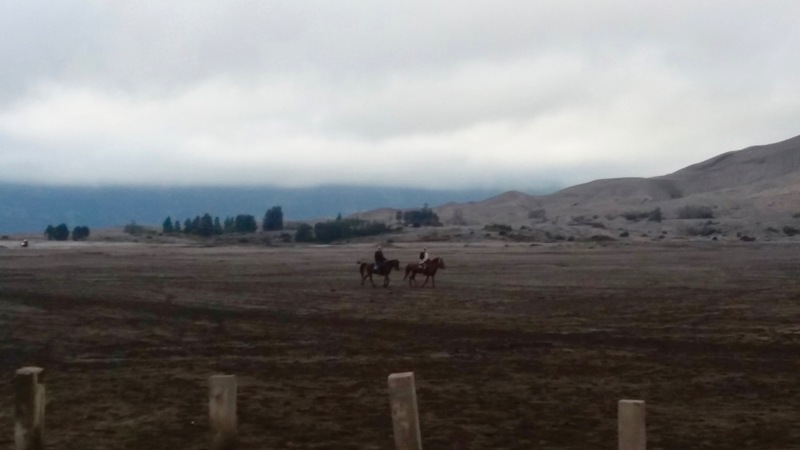 That is how epical Bromo is… The horses are for the visitors who are too lazy to walk or can’t walk due to healkh reasons, For around 15 US dollars you can rent a horse to climb up the hills. 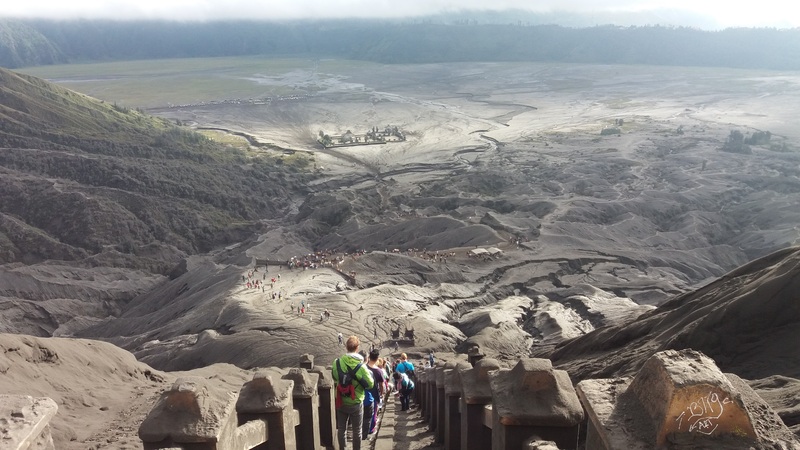 We preferred to walk and climbed the stairs which were 250-300 steps to reach to the crater. As I gazed into the crater for minutes, Nietzche’s famous quote came to my mind: “And if thou gaze long into an abyss, the abyss will also gaze into thee.” I didn’t want to come down, being on the edge of a tunnel that was leading to the center of earth. After a couple of hours we arrived to our hotel to spend the night. We didn’t really spend the night as we left in the midnight again but at least we had a few hours to charge ourselves and our batteries. Kawah Ijen Volcano, hosts an active sulphur mine and the burning sulphur gas creates the blue fire phenomenon which attracts a lot of visitors. To be able to reach Ijen, you have to climb a 3 kilometers road with a 60 degrees pitch angle. The climb, started at 3 am and ended around 5:30 am to see the sunrise, I have to confess it was one of the hardest treks of my life. On top of being sleep deprived for 2 long days, I climbed the road with such difficulty that I was having hard time to catch my breath. 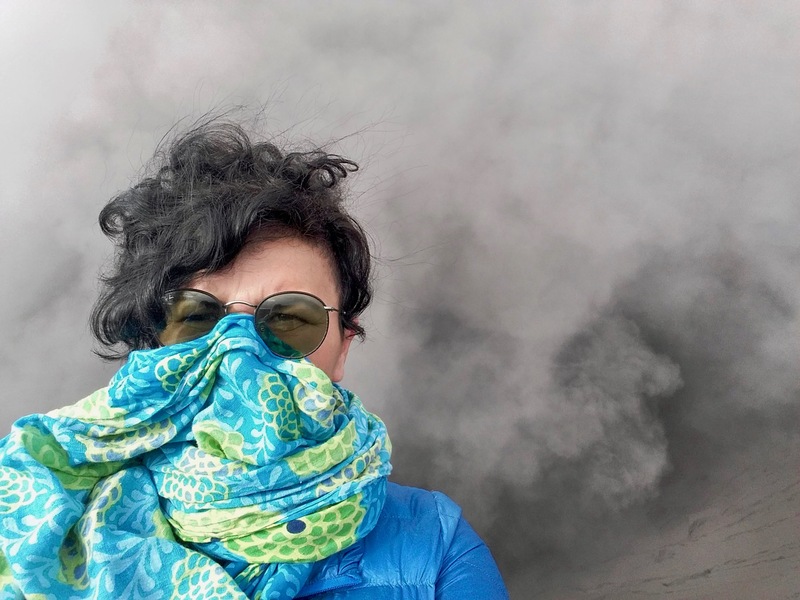 The moment I thought it was over, I found out that I have to go down for 700 meters, inside the crater to be able to see the blue fire closely. 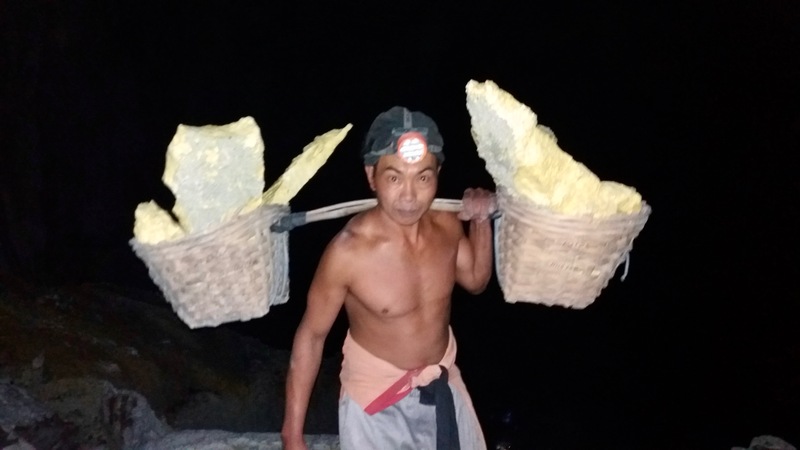 Just when I was feeling like crying, I saw the miners carrying loads of Sulfur on their backs uphill from the crater and I felt ashamed of myself. 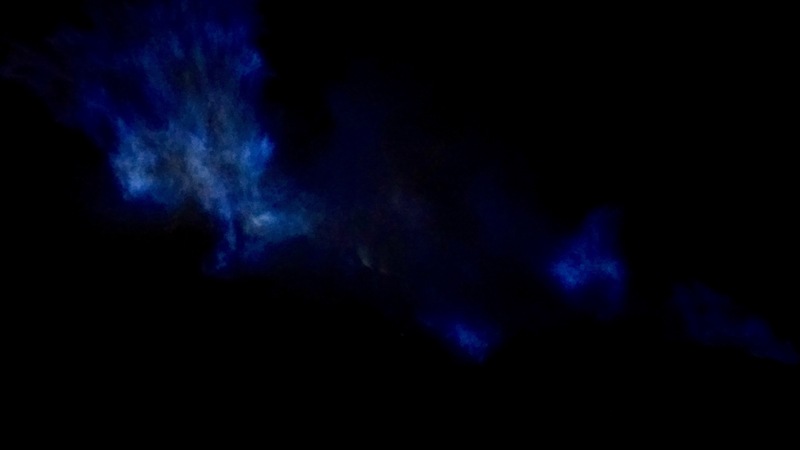 I started hopping down the rocks and I got close to the blue fire as closest as I could. When the guide told me that I had to climb up again to be able to see the sunrise, then I rebelled. “I really don’t care about the sunrise at all, I just want to sit by this beautiful lake and rest my bones” I responded, only to find out that lake being an acid lake. As the sun rose and the neon yellow colors of the sulphur rocks revealed themselves, I have realized the beauty of the place. It was like one of the Star Wars universe planets. The climb back was painful but it was totally worth it. Later on, the tour company dropped us to the ferry terminal to leave for Bali and the action part of Indonesia was finally over for me.